A friend of mine who dwells in Richmond gave me a copy of this slim volume, which was signed by the author himself. The work is filled with interesting vignettes of events which receive scant attention in the history books. This, added to the author’s clear, vivid, and entertaining style, makes this volume a must for the aficionado of the American Civil War. The episodic nature of the work makes it difficult to talk about the content without spoiling it. 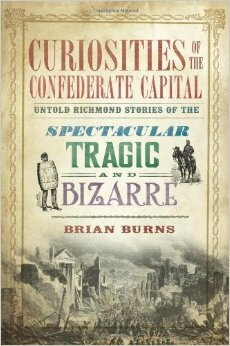 It covers everything from an accident at a munitions factory through the favorite foreign novel of the Confederate army to an abolitionist’s take on the fall of Richmond. The only thing which connects the stories are the time, place, and Burns’s fine prose. So many interesting facts abound in it that it is very hard to stop turning pages, and it would not surprise me if some could finish it in a sitting. May many of my dear readers get the chance to enjoy it!